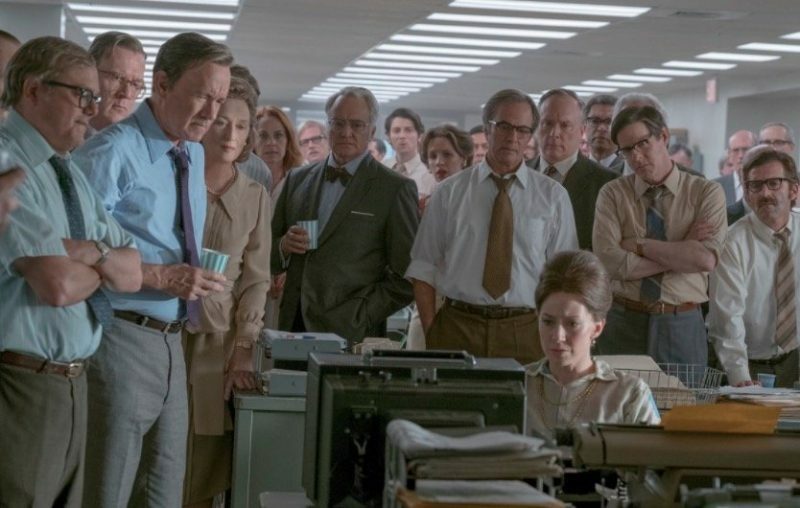 The Post won’t appeal to everyone—it’s a predominantly dry, talky affair full of scenes of stressed-out people in smoky rooms and stacks of papers debating the course of action—-but for those who appreciate docudramas celebrating the triumph of investigative journalism over power, it’s a stirring spiritual brother to movies like All the President’s Men (to which it serves as a sort of direct prequel) and Spotlight. In its portrayal of the free press versus an American President skirting the limits of his authority, The Post feels timely and relevant, and stresses the importance of an independent press. The Supreme Court’s 1971 ruling that “the press exists to serve the governed, not the governors” is worth recalling today. After a cold open in Vietnam in 1966, the rest of the film takes place in 1971 New York City, where The Washington Post‘s cautious owner Kay Graham (Meryl Streep) is about to preside over taking the company public with the backing of investment bankers she needs to keep her family company financially lucrative. A wrench gets thrown in the gears of this smooth transition when the investigative journalism team, led by the bulldoggish Ben Bradlee (Tom Hanks) gets wind of their rival The New York Times getting its hands on The Pentagon Papers, a 4,000-page document commissioned by the Department of Defense chronicling the United States’ involvement in Vietnam from the Truman administration to the present day, and exposing damaging details of how the US government and multiple consecutive presidential administrations have been misleading the American public about the war for decades. When the Nixon administration blocks the Times from publishing the documents, citing national security concerns, Bradlee sees an opportunity to break the story for The Post—which has thus far lagged far behind in readership and national attention—dispatching his minions to ferret out The Times’ source and publish the documents himself. Bradlee’s aggressiveness throws The Post into a legal quagmire and threatens to alienate skittish investors leery of crossing the notoriously vindictive Nixon. It falls on The Post‘s unassertive owner Kay Graham to make a tough decision, something she’s not good at doing: put the brakes on Bradlee, or allow the story to play out. While there’s an ensemble of supporting characters, The Post in some ways could almost be boiled down to a two-person play. The clashing dynamic between Bradlee and Graham drives the action. Bradlee is the same at the end as the beginning, a dogged reporter who hunts down a story like a bloodhound, driven by unshakable convictions that Nixon’s attempts to interfere with the free press is a violation of American freedoms and that publishing the story is a moral imperative. Graham has the character arc of a timid, unassertive woman finding her backbone. While the crusading Bradlee glibly throws caution to the wind, Graham is keenly aware of how much she has to lose—The Washington Post has been her family’s company for generations—and tries to navigate the situation cautiously. Her pivotal turning point comes in a tense conference call when she finally, agonizingly, makes the decision to support Bradlee’s actions, a decision which, had things gone differently, could have destroyed The Washington Post and sent both of them to prison. Period detail is impeccable, and Spielberg puts equally meticulous detail into the workings of a 1970s newsroom and how papers were set up and printed before the age of widespread computers. Snippets of news reports by Walter Cronkite drive home the sense of verisimilitude. Nixon himself is “played” by a combination of a shadowy silhouette filmed from behind through White House windows and audio clips from the Nixon Tapes pertaining to the events of the film. Nixon “plays” himself from beyond the grave, recalling the way the Edward R. Murrow docudrama Good Night and Good Luck used real footage of Joseph McCarthy instead of an actor, letting both films’ “villains” speak for themselves. The movie also puts considerable emphasis on Kay Graham being in a position of power as a woman that was unusual at the time; her board is otherwise comprised entirely of men, many of whom doubt a woman’s leadership capabilities, and we get a little monologue from Bradlee’s wife (Sarah Paulson) driving home the point. Later, there’s a scene where Graham exits the Supreme Court and is surprised to find herself surrounded by female admirers. 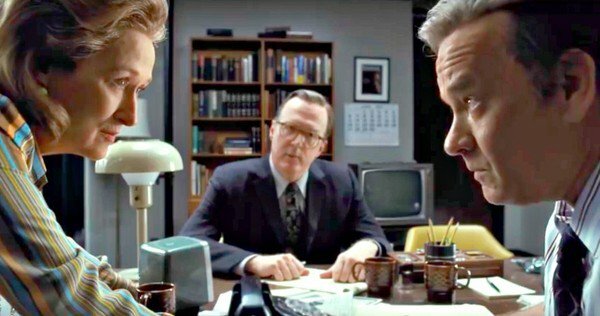 The Post might appeal to the same audience that enjoyed Spotlight; both are spare, terse docudramas putting emphasis on the details and procedural of investigative journalists in a David vs. Goliath struggle against a powerful authority figure (in Spotlight the Boston Roman Catholic Church, here no less than the White House). In fact, Spotlight‘s cast included John Slattery as Ben Bradlee Jr., the son of the man Tom Hanks portrays here, giving the two films some thin-connective tissue both in characters and subject matter. It also serves as a direct prequel-of-sorts to All the President’s Men (in which Bradlee was played by Jason Robards); The Post epilogues with the Watergate break-in. The acting is on the solid level one would expect considering it’s headlined by Tom Hanks and Meryl Streep, and while neither gives an exceptional performance, they are steady, reliable presences that effectively anchor the proceedings. The supporting cast, consisting of lower-profile character actors, is capable, especially Bob Odenkirk as the impassioned crusading journalist Ben Bagdikian and Bruce Greenwood as Secretary of Defense Robert McNamara, but this is an ensemble, not an actors’ showcase; smaller supporting roles include Alison Brie (as Graham’s daughter), Sarah Paulson (as Bradlee’s wife), Matthew Rhys (as the source), Tracy Letts (as Graham’s closest adviser), Bradley Whitford (as one of her skittish board members), Michael Stuhlbarg (as their rival at the New York Times), and Jesse Plemons (as The Post’s nervous legal counsel who’s dismayed by what they’re getting themselves into). Together with All the President’s Men and Spotlight, The Post almost serves as the first in a loosely-connected “trilogy” of sorts, engaging and relevant docudramas extolling the virtues of investigative journalism and speaking truth to power. While likely a little too dry and talky for mainstream audiences, for those who appreciate this sort of thing, it’s another righteous ode to the behind-the-scenes unsung heroes who play a vital role in fighting for truth and the freedoms of an independent press. The movie might chronicle historical events from 1971, but often feels as if it’s speaking to the current political climate, and it’s perhaps that more than anything that makes The Post worthy viewing.